Vinita shares tips and experiences about all things related to growing an organic garden. How much water do plants really need? 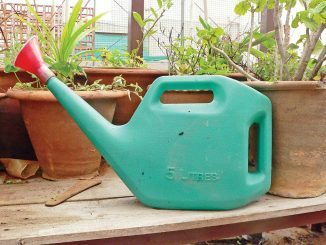 How do you avoid over-watering? You can use organic options like Panchagavya, Vegetable enzymes, tea compost etc. to ensure a healthy soil for your plants. You can also make them yourself! The three hour workshop was a fun mix of story-time, experience-sharing, eating some delicious food prepared from fresh vegetables and finally some hands-on seed sowing. Typically, urban children today are given little or no opportunity for physical contact with nature. They spend less time in and with nature – so how can they build a relationship with it? Companion planting is a core element of organic gardening. This has proven to have improved the yield of surrounding plants and even improve the flavour of neighbouring plants. Your little garden is not just for your plants. It supports a lot of animal life too. Do you see butterflies and squirrels in your garden? Powdery mildews and mealy bugs are the biggest problems faced by gardeners. Here are some non-chemical, DIY solutions to keep them away. It is important we keenly observe the type of insect and the nature of ‘attack’ before shifting to panic mode and seeking out a solution to exterminate the organism completely. We normally discard the cauliflower leaves and beetroot leaves. But they are packed with nutrition and taste great too. Contrary to popular belief not all weeds are unwanted, useless and harmful. There are some weeds that extremely useful for the gardening enthusiasts.